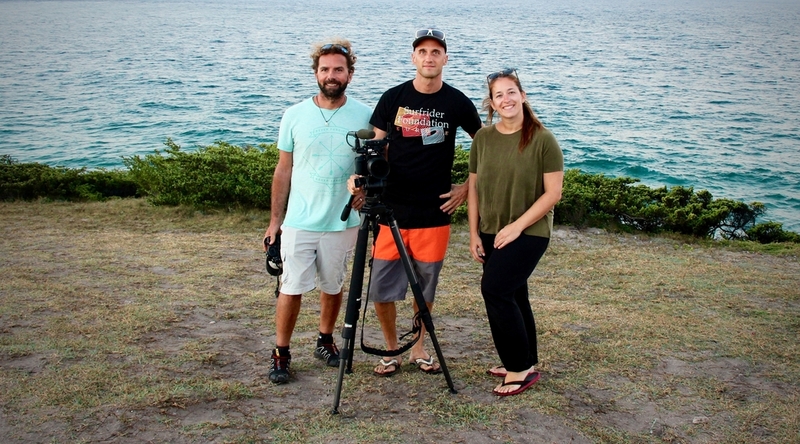 A small team from the Luxembourgish TV station RTL (Deborah Ceccacci, Sam Bouchon and Marc Aragones) joined Pierre Gallego this summer during his field work in Mozambique, where he studied humpback whales with our collaborators from Africa Underwater. The result was a great documentary that was aired on TV on 3 January 2017. The documentary describes Pierre Gallego’s work and gives an insight into the daily life of a marine biologist during the field season: boat surveys, photo-identification, biopsy collection, interaction with volunteers, acoustics, and much more. When asked about where he sees Odyssea in a couple of years, Pierre replied that he would love to see Odyssea grow more by establishing more collaborations in Luxembourg, helping to secure our ongoing research and conservation projects. We hope the documentary made people rethink the apparent incompatibility between “Luxembourg” and “marine biology” and that they will join us on future expeditions. You can watch the documentary (only in Luxembourgish) on the RTL website. A big thank you to the RTL team for their terrific work! Pierre Gallego (left) with RTL team Sam Bouchon (middle) and Deborah Ceccacci (right).